Leading Manufacturer of 10 ton c type power press, 10 ton c type power press 1, 10 ton c type power press 2' st., 15 ton c type power press, 20 ton c type power press and 20 ton c type power press 2' st from Rajkot. Shailesh brand 10 Ton C Type Power Press mechanical power presses are combing in both C frame and pillar type versions from 3 tons to 300 tons capacity in most economical type of construction with several std/optional features such as manual /auto lubrication system knockouts electronics hand safety single/double or un-geared versions as also pneumatic feeders/straightness and de-coilers for automation purpose. We are providing 15 Ton C Type Power Press to our clients. 30 Ton C Type Power Press 31/2' St.
We are providing 30 Ton C Type Power Press 31/2' St. to our clients. We are providing 50 Ton C Type Power Press to our clients. We are providing 60 Ton C Type Power Press to our clients. We are providing 75 Ton C Type Power Press to our clients. We are providing 100 Ton C Type Power Press to our clients. We are providing 150 Ton C Type Power Press to our clients. We are providing 200 Ton C Type Power Press to our clients. We are providing 250 Ton C Type Power Press to our clients. We are providing 300 Ton C Type Power Press Machine to our clients. 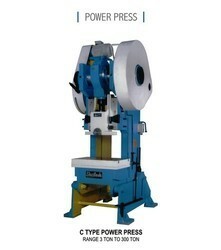 We are providing C Type Power Press to our clients. We are providing 85 Ton C Type Power Press to our clients.